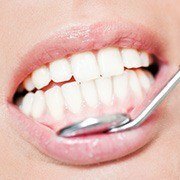 Gum disease (also known as “periodontal disease”) is one of the most common health problems on the planet, as well as the clear leading cause for tooth loss among American adults. This gradual bacterial infection can develop in sneaky ways over time, which is why it’s so important to be visiting a trusted dentist like Dr. Isaacson for ongoing preventive care. If we do discover tell-tale signs of harm, effective therapy options are available to revitalize the health of the gums and help get your smile back on track here in Oklahoma City. Contact us today to schedule a visit! Why Choose Joe Isaacson Dental for Periodontal Therapy? While traditional hygiene may be enough to combat the presence of gum disease in its earliest stages, more moderate symptoms will require our team to progress to the next level – scaling and root planing. This in-depth cleaning has two distinct components. First, we’ll start by “scaling.” Using special instruments, our team will thoroughly and carefully remove all of the plaque build-up and hardened tartar from both above and below the patient’s gum line, paying special attention to the vulnerable areas at the very bottom of the periodontal pockets. Once this stage is complete, “root planing” will involve the gradual smoothing of the tooth root surfaces, which are prime targets for dangerous bacterial accumulation. By getting rid of the rough spots on these surfaces, we can encourage the gum tissue to naturally reattach in place over time. At Joe Isaacson Dental, we take pride in combining our patient-driven care approach with the most sophisticated tools in modern oral healthcare, such as the state-of-the-art soft tissue laser. Instead of relying on traditional scalpels and sutures for treating gum disease, this advanced technology can precisely eliminate infected tissue from the mouth while also providing immediate sterilization that helps to minimize oral bleeding. The focused beam may even encourage the growth of new, healthy tissue in its place! Soft tissue laser therapy is so comfortable and minimally invasive that many patients don’t need local anesthesia to feel relaxed throughout the treatment process. Better yet, the recovery period is greatly accelerated as well, and it’s easier than ever to return to a regular routine right away.